Thanks to their intelligent automatic modes, today’s digital cameras do a great job of capturing pictures—most of the time. But there are some situations that can befuddle even the best camera. Shots such as a dimly lit party scene or the view from an airplane window require a little extra work on your part. They also present opportunities for getting images that are far more interesting than the typical snapshot. I’ll show you how to get photos you can be proud of, in five particularly challenging photo scenarios. The Problem: Kids are hard enough to keep up with in real life. Capturing them on the two-inch LCD of a digital camera can seem nearly impossible. By the time you frame the shot and push the shutter button, you’ve already missed the action. 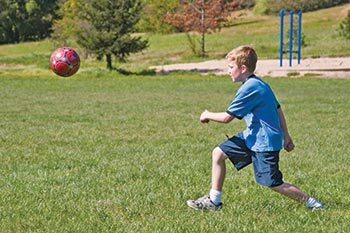 The Solution: To get good shots of children at play, use the techniques that sports photographers use. Increase Your Shutter Speed Fast shutter speeds help freeze action. First check to see whether your camera offers a shutter-priority mode—most digital SLR (single lens reflex) and advanced amateur cameras do. This mode lets you specify a shutter speed and then has the camera set the proper aperture. Start with a setting of 1/250, 1/500, or 1/1,000 of a second. If your camera warns you (often by flashing a red light) that there isn’t enough light for your desired shutter speed, try changing your ISO setting to 400. This increases the sensitivity of your image sensor. If you still get a warning, dial back the shutter speed one notch—from 1/500 of a second to 1/250, for example. If your camera doesn’t offer a shutter-priority mode, search its menus for a sports setting—these settings often use the same approach. On the Go To photograph speedy subjects, such as children at play, try to anticipate where the action is headed, and have the camera ready. A fast shutter speed, such as 1/500 of a second, also helps. Your flash can also help freeze action—as long as the kids are within its range, which is typically about eight feet. Set your flash to its flash-on mode, which will force it to fire even in well-lit situations. Anticipate Movement Your chances of getting a good shot will often increase if you can capture the subject at the peak of the action. When a basketball player tries to make a basket, for example, he or she jumps into the air, waits to achieve maximum elevation, and then releases the ball. At the jump’s peak, there’s actually less movement, making it easier to capture a clean shot with less motion blur and a more interesting composition. Developing good timing takes practice. Complicating the process is the problem of shutter lag, the time between when you press the button and when the camera actually records the image. Compact models tend to have a longer shutter lag than digital SLRs. You can help reduce shutter lag by setting your focus to its infinity or landscape mode (often represented by a mountain icon in your camera’s mode menu). This locks the focus so your camera doesn’t have to waste time determining the right setting before firing the shutter. Another trick of the pros is to focus on an area that you expect the action to move to. Pick your spot and hold the shutter button halfway down. This locks in both the focus and the exposure settings. Continue holding the button until just before the action reaches your spot, and then press it the rest of the way (see “On the Go”). If you’re still having trouble getting the shot, select your camera’s continuous (or burst) mode. Your camera will continue to shoot for as long as you hold down the shutter button—or at least until the camera’s buffer fills up. Odds are that one or two of those frames will be pretty good. And if all else fails, try bribery. Entice your kids to slow down a bit by offering them a snack. The Problem: Whether it’s an exotic land seen from an airplane window or a shark cruising inside a public aquarium, some of the world’s most interesting subjects are on the other side of glass. But if you’re not careful when setting up the shot, you’ll end up with a self-portrait instead—or worse, a picture of your flash’s reflection. Through the Looking Glass Underwater encounters are just one of the shots waiting for you on the other side of the glass. Just make sure you turn off your flash before you shoot. The Solution: The mistake many people make in this situation is to stand too far from the glass. When you do this, you pick up all the light sources in the room reflected in the shiny surface. The key, then, is to eliminate these reflections by placing the front of your lens barrel as close to the glass as possible. This makes the glass just another lens filter (see “Through the Looking Glass”). The best way to do this is to screw a rubber hood onto the front of your lens and then press that hood against the surface. You can pick up a rubber hood at most camera-supply stores for less than $10. Because the hood is rubber, it lets you tilt the camera a little in any direction as you compose the shot, without losing contact with the glass. You can also use a rigid lens hood for this, but you’ll have to shoot straight on to maintain contact with the glass. If you don’t have a lens hood with you, cup your hand around the edge of the lens barrel and then place it against the glass. Some light may still leak into the shot, but you’ll eliminate most of the glare. (Never place the front surface of your lens directly against glass. Most lens barrels have a front lip that prevents this, but you should double-check.) Also make sure your flash is turned off. 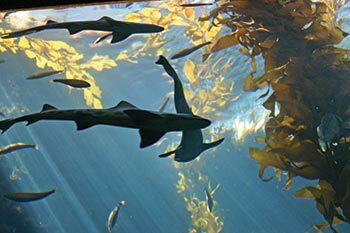 If the lighting is dim—as is often the case at an aquarium, for example—increase the ISO to 400. By the way, I’ve noticed that photos shot from an airplane window tend to look a bit dull when I first review them in iPhoto. Don’t panic. The lighting conditions at 30,000 feet are different from those in your backyard. Go to iPhoto’s Edit mode and click on the Enhance button. Your photo will spring to life. The Problem: A friend has asked you to photograph his paintings so he can create an online portfolio. Sounds like a piece of cake, right? But when you start shooting, you’re frustrated to discover that the rectangular paintings keep coming out skewed with odd angles. The Solution: The battle you’re fighting is against optical distortion. This usually isn’t a problem when you’re photographing people and places. Lenses are optimized for that. But capturing a perfectly square picture frame is another matter altogether. Get Level The trick is to position your camera so its lens is perfectly parallel to the plane of the object you’re shooting. And I do mean perfectly . Start by positioning your subject so it’s perpendicular to the floor. If it’s a picture, mount it flush against the wall. If it’s an object, position it on a level surface. Mount your camera on a tripod, and position the tripod so it’s directly opposite the subject, making sure that the center of the camera lens is pointing directly at the center of the subject. Adjust the tripod so the camera’s bottom is parallel to the floor. In my experience, you’ll get the best results by placing the camera five feet or more from the object so you don’t have to use the wide-angle end of your zoom lens. Generally speaking, wide-angle settings show more distortion than focal lengths in the middle of your zooming range. So if you have a 28mm-85mm zoom, start at the 50mm setting. If you’ve positioned everything correctly, you should see a squared-up object in your viewfinder. If you don’t, adjust the camera’s alignment until you get it right. Use Natural Lighting To avoid glare from the flash, I recommend using natural lighting for this type of shot. A north-facing window is an ideal light source. Change the white-balance setting to Cloudy to compensate for the cooler color temperature inside, and leave your ISO set at 100. Finally, activate the self-timer so you won’t jar the camera during the exposure. When you show the picture to your friend, he’ll probably just thank you without a second thought. There’s no way to appreciate how challenging these shots are until you try one yourself. But you’ll know the truth. The Problem: Despite the fact that you’re shooting on a bright, sunny day, everyone in the foreground of your photos appears to be lost in the shadows. The Solution: Your portraits look gloomy precisely because it’s so bright outside. This problem, known as backlighting, is the monster waiting to prey upon our outdoor shots. When set to its default metering mode, a camera automatically exposes for the brightest area of a scene—in this case, the sky. But you actually want it to expose for the subject. Use a Fill Flash Turning on your flash is probably the easiest cure for backlighting—as long as your subject is within range of your flash. Your camera will do its best to expose properly for the background while producing enough light with the flash to illuminate the nearby subjects (see “Let There Be Light”). This simple technique can transform a disappointing portrait into a stunning one. Let There Be Light Backlighting on a bright day can cause your subject to be underexposed (left). 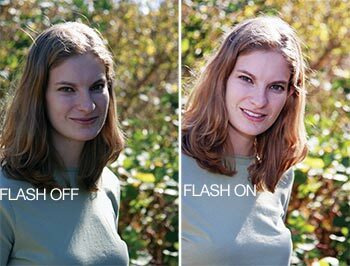 By turning on the flash, you can balance the lighting for a more flattering portrait (right). Spot Meter If you don’t want to use your flash, or if the subject is too far away, try changing your camera’s metering mode. The default metering mode on most cameras is evaluative. This means that the exposure system measures all parts of a scene—including strong backlighting—and then decides on the best exposure settings. Switch your camera instead to spot or partial metering. In this mode, the camera reads only the light that’s in the center area of the frame, which is usually where the subject is. Lock the Exposure Another way to achieve the same result is to lock the camera’s exposure while pointing it at an area of the scene that has about the same amount of light hitting it as your subject does, and is about the same distance from you (often, this can be a patch of grass). Hold the shutter button halfway down to force the camera to lock in the meter reading. Then, while still holding the shutter button halfway down, compose your shot and take the picture. This will save you the effort of fiddling with your camera’s metering settings. The Problem: The pictures you took at your sister’s evening wedding reception were a huge disappointment. The outdoor setting was beautiful with romantic lighting. But in the photos, you can’t see any of that. The guests might as well have been standing against a black backdrop. The Solution: Tired of your nighttime party shots looking like they took place in the dungeon of doom? The problem, once again, is the camera’s automatic-flash mode, in which the camera typically locks the shutter speed at around 1/60 of a second. That’s fine for shots where you have a decent amount of ambient light. But once evening sets in, that shutter speed is too fast to capture an environment’s subtleties. So while the flash does a good job of illuminating the subjects within range, everything farther than eight feet away fades to black. Here’s how to get some light, and life, into your party photos. To do this, you’ll need a camera that offers a manual mode. Set the camera to a shutter speed of 1/30 of a second with an aperture of f5.6, and then turn on the flash. The camera will calculate the proper flash exposure. The aperture setting is less important here than the shutter speed. Today’s sophisticated cameras seem to produce good flash exposures regardless of the aperture you set, as long as it’s reasonable for the amount of light your flash produces—you might have a problem at f22, for example. Dancing in the Dark In low-light settings, the background often disappears into blackness (top). But with the slow-synchro flash (bottom), you not only see the bride dancing with her son, but also can enjoy the expressions of the people looking on. If your background is still too dark, reduce the shutter speed more—try 1/15 of a second, for example. Be sure to hold the camera steady. If your background is too bright, speed up the shutter. Use Slow-Synchro If your camera doesn’t offer a manual mode, you’re not out of luck. You can also use your flash’s slow-synchro mode—sometimes called nighttime flash—to capture dim backgrounds. This setting isn’t usually located with the standard flash modes. Instead, you’ll probably find it with the picture modes—Portrait and Sports, for instance. The slow-synchro mode is wild. The camera reads the background and sets the shutter speed accordingly—even if it means keeping the shutter open for an entire second (which is forever in the world of photography). As a result, moving subjects will show a little blurring. But your shot will better capture the mood of the scene (see “Dancing in the Dark”). As with any low-light photography, you might want to increase your ISO setting to 400 to make your camera more sensitive to light. And keep shooting. You’ll end up with lots of shots that are too blurry because the subject moved during the long exposure. Try not to worry about those. The remaining shots will be striking and unique.